Get 55% Off Hotels in the Sale at Ryanair Save money on Hotels at Ryanair! Flights from £19.99 at Ryanair Pick a place and travel the world from £19.99 at Ryanair! Ryanair leads the flight path in budget air travel; connecting 33 countries with 1,800 daily routes and taking a whopping 90 million customers on holiday a year. Their low prices have opened up hundreds of holiday possibilities for British travellers and holidaymakers, from city breaks to catalogue-perfect white sand and topaz sea beaches, there’s a flight to fit the bill for your break away. 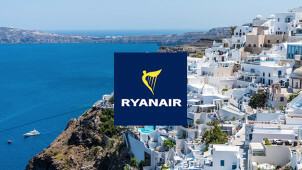 Ryanair’s approach to air travel has opened up the great door in the sky to the masses, allowing fast, efficient and most importantly; cheap travel connecting a choice of 190 destinations across 30 countries. Just book your flight with vouchercloud to leave more in your budget for the things that matter to you, like a hotel with a pool or fun-filled family activities. That way you can leave the worries behind you, as you dream of cocktails by the pool, late night wanders along the beach and markets bursting with sights and smells to delight your senses. With cheap Ryanair flights to France, Italy, Malta, Morroco, Belgium, Greece, Cyprus, Croatia, Spain, Germany and Norway and many, many more European destinations – your dream destination is within your reach! How do I use my Ryanair voucher? Choose Ryanair Family Extra when you book you flights if you’re travelling with children, and save a packet on baggage, insurance and even future flights! How much is the Ryanair luggage cost? Ryanair offer the lowest fares to make sure you don’t compromise much needed holiday time. To make your trip as affordable as you like, you can choose what baggage you’d like to fly with and keep track of the cost of added extras, especially when you use your Ryanair baggage discount code. You can buy up to 3 bags per passenger, and if you’re travelling with children you could save a satisfactory amount on the cost of their baggage. There also set prices for odd shaped luggage and baby equipment, so you can add pushchairs, sports equipment and musical instruments to your fare as you wish. Can I reserve a seat on my Ryanair flight? There are 3 different seat options available on Ryanair aircraft, all of them will cost you extra on top of your ticket price to reserve. Book a standard window seat ahead of time from £4 a seat, or jump the queue with a priority boarding reservation for £13. To stretch out and relax, book priority with extra leg room from £15. The Ryanair Help centre is brimming with useful advice, answering every imaginable question or concern you may have with clear and concise information. Browse through theit FAQs, or speak to a friendly customer service advisor via the Ryanair Live Chat service. You can also contact Ryanair with your query by using their Contact Us page online, which supported in English, German, Spanish and Italian and Portuguese languages. To talk to someone right now, we suggest you use the Live chat service on the Ryanair website. An online agent will be available to answer your questions in real time. Don’t let the cost of air travel strip all the fun out of booking your summer holiday. We’ve teamed up with Europe’s low cost airline revolutionaries Ryanair to arm you with the fantastic money-saving benefits of a Ryanair voucher from vouchercloud to use the next time you’re looking to escape. Searching for the cheapest flights is often a time-consuming and dull affair, so say so long to time spent trawling websites online, and wave hello to your holidays! Stastically speaking, flying is one of the safest forms of travel out there, and out of all of your options for taking to the skies, Ryanair's safety record is one of the best. In fact, it's one of very few carriers to have never had a major incident in the skies, with the exception of an emergency landing in Rome in 2008, so when you click Ryanair, you're taking one of the safest roots to wherever you're going! For sun, sand and sea, the Algarve never fails to deliver. Wander the stretches of coastline with sand between your toes, dine in seaside towns and bask in the heat - it’s got everything you could want for the perfect summer break. Book your getaway with a Ryanair discount code and get your holiday off to the budget start you need to keep your holiday spending to a minimum. That way you’ll have more money leftover to enjoy the world-class golf courses, boating trips or a cocktail or three!